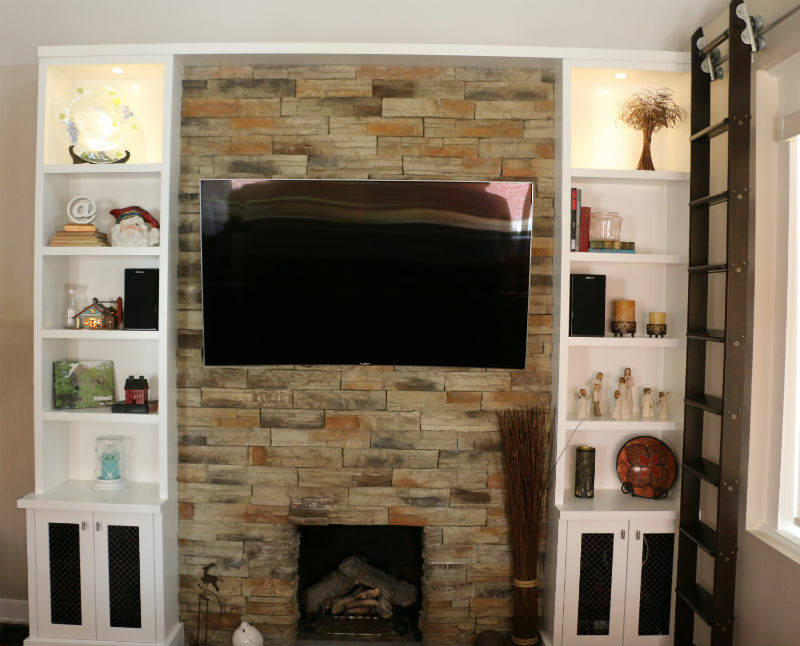 This TCC wall unit renovation for one of our repeat clients in the Lakeshore area of Etobicoke was another great project whereby we did a remodel of their existing fireplace on their main floor to provide a new stone facade and also to provide additional storage via new built-in wall units on each side of the fireplace and TV. The lower wall unit cabinets were built with a white shaker door style highlighted with a black mesh insert for hiding away electronic components and the TV receiver. The stone refacing highlights natural orange and beige undertones and it matches well with the espresso coloured sliding ladder that runs laterally beside the wall unit. The shades of grey in the stonework are brought out by the black TV.